Council members discuss former city manager Tim Gobble on Thursday during the East Ridge City Council meeting. • About $79,000-worth of base salary payments, to be paid monthly through Sept. 7. • Full health insurance benefits through September 2013. • 100 of his 200 hours of his accrued leave time paid by the end of the month. • The city will defend him in any lawsuits filed in during the course of his duty as city manager, and he will work with the city on all such litigation. East Ridge City Council will have a special called meeting Monday at 6 p.m. at East Ridge City Hall to discuss qualifications for an interim city manager. The blue nameplates for East Ridge City Council were set up thirty minutes before the night's agenda session started. But no name plate was placed at City Manager Tim Gobble's usual spot. As citizens began to file in, the whispering grew louder and louder. Was he going to be fired? Was he already gone? By the time the meeting started, Public Safety Director Eddie Phillips had taken Gobble's seat. While people in the large audience started to murmur "he's gone," Gobble was heading out a back door in City Hall, into the parking lot to a waiting car. East Ridge council members voted 3-2 Thursday night to accept Gobble's resignation and to pay him seven months worth of salary -- about $79,000 -- instead of terminating his contract, as was widely speculated. "I'm sorry things didn't work out with East Ridge," Gobble told a reporter as he walked to his car. "I wish the city well, I sure do. We've done a good job here while I've been here. I've enjoyed my time here. I've learned a lot. And I'll be moving on." Gobble, who was hired in the spring of 2011, ended up leaving behind the keys to his city-issued Passat and was given a ride out away from City Hall by his assistant Chris Clabough. Gobble's hire of Clabough, a church friend who is 19 and is earning $35,000, has been just one of the controversies the former city manager has been at the center of lately. He had also caught flak from other council members and citizens for his discipline of the city's court clerks after he said they mishandled a case in which his daughter was the victim, and lengthy argumentative interactions with citizens on Facebook. But as Gobble left, he said that he was proud that he left the city in good financial shape, and that he implemented successful programs like recycling. "I enjoy city management. Besides its difficulties and its problems, it's very rewarding," he said. "This type of stuff is hard to go through, but it's a rewarding career and I will maybe continue to look in that field." Gobble's career has been devoted almost exclusively to the public sector. Before coming to East Ridge he had been Bradley County sheriff -- a post he left to make an unsuccessful run for Tennessee's 3rd District congressional seat in 2010. Before that he had been a U.S. Secret Service agent and a councilman in Cleveland, Tenn. He had most recently been named chief of the Hamilton County Jail before getting the East Ridge city manager job in a unanimous council vote. Gobble said Thursday he liked working in the public sphere, but that he "may look at the private sector." By agreeing to pay Gobble the severance deal, council members say the city saved about $4,000 it would have paid to fire him without cause based on the former city manager's $125,000 salary. If Gobble was fired with cause, the city would not have had to pay any severance -- but it would put the city at risk for a lawsuit, several councilmen said. Just two months ago, East Ridge leaders fired longtime city attorney John Anderson, paying about $40,000 in severance for his departure. The terms of Gobble's deal were hammered out in a brief executive session behind closed doors, and not everyone in the council was involved in the negotiations. Both Mayor Brent Lambert and Councilman Larry Sewell said they remained in the dark about back-and-forth between the other council members, Gobble and the city's attorney. Lambert said that he only found out about the terms of the deal as a paper was handed to him during the sudden executive session. "I hope that the process going forward is certainly more open and transparent than it apparently was today," said Lambert. "Tim did a good job, and he is a good man. I would have wanted him to stay." 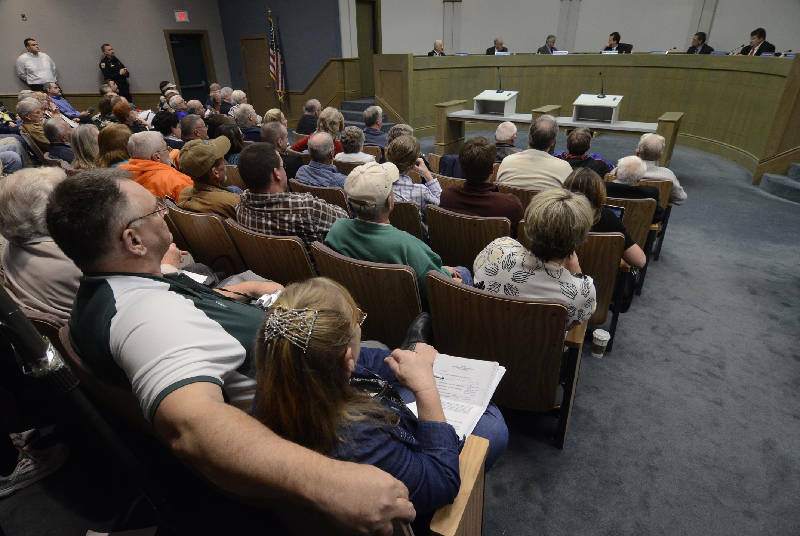 During Thursday's packed meeting, the council had no discussion before the vote on Gobble's contract. Lambert and Councilman Larry Sewell simply and decisively voted "no," and Vice Mayor Jim Bethune and Councilmen Denny Manning and Marc Gravitt voted "yes." After the vote, Lambert announced, "Tim Gobble is no longer city manager of East Ridge," at which point several citizens quietly said "Amen" and clapped their hands. Once the terms were accepted, Gravitt motioned to hold a workshop to discuss qualifications for an interim city manager. For the time being, city manager duties will be performed by Phillips, who said Thursday night that this is his sixth time serving as interim city manager over his 20-year career with East Ridge.